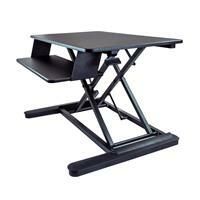 This sit-stand desk converter, featuring a large work surface, lets you change your working position with ease, to enhance your comfort and productivity. The sit-stand workstation is designed to support your ergonomic needs. With one touch, you can switch your position to sitting or standing, to keep a balanced level of movement. 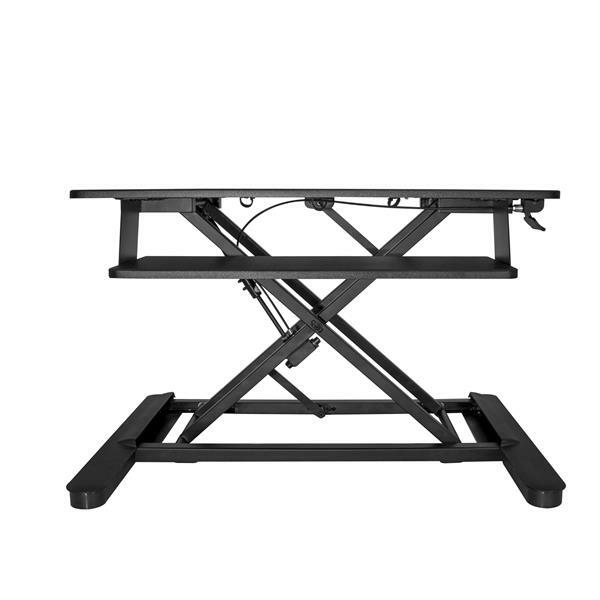 The workstation features an advanced pneumatic arm that provides effortless movement - you simply raise or lower the platform with one touch of the lever. You can adjust the standing desk to match your exact height requirements, with a height adjustment range of 15.7” (399 mm). Create an ergonomic work space at a fraction of the cost of a standing desk. 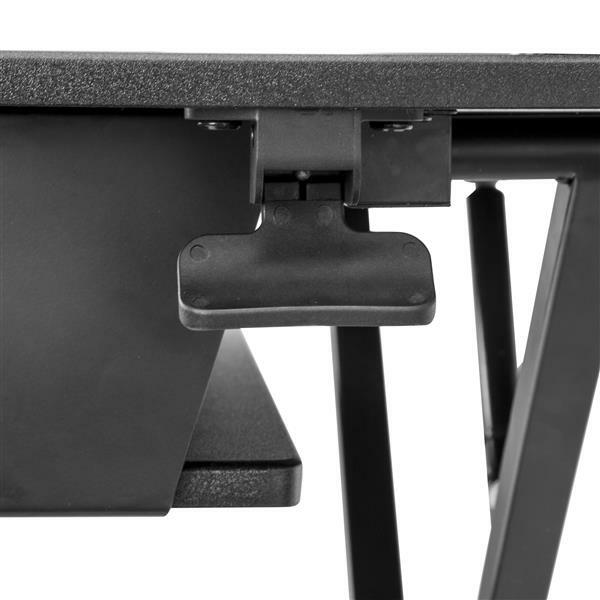 Simply place the sit-stand desk converter on your existing work surface (minimum 26” depth), to enjoy the benefits of a height-adjustable standing desk. With a large 35” (wide) work surface, the sit-stand workstation gives you plenty of setup options, supporting two monitors (up to 24” each), or one monitor (up to 30”), with a generous weight capacity of 12.7 kg (28.1 lb.). You can also use the grommet hole and provided hardware to mount a monitor arm to the workstation. It supports many StarTech.com monitor arms including ARMDUAL, ARMPIVOT and ARMSLIM. The ARMSTSLG is backed by a StarTech.com 2-year warranty and free lifetime technical support. Note The keyboard tray (26.8” x 10.4”) has a weight capacity of 5 lb. (2.3 kg). (5 stars) Solid and Smooth! 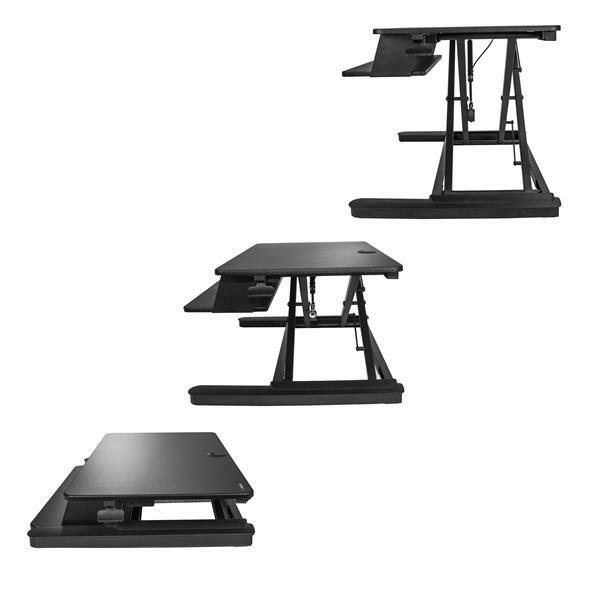 This Sit-Stand Desk Converter come pre-assembled and feels very solid and secure. Even with several monitors and a laptop it feels very stable. Changing heights is easy and smooth and requires little effort thanks to the hydrolics. Fits most desk surfaces and the rubber feet keep it in perfectly in place. My kids even use it on the floor without a desk when they use their laptops or draw while watching TV. I received this product in exchange for an unbiased review. This has an elegant, sturdy design and is big enough to fit multiple monitors and my laptop all on the surface. Once you get some gear setup it's incredibly easy to move and down manually and the locking mechanism locks tight with no play in the system. The combination of the weight of the unit and the rubberized feet make it very sturdy and I have no fear of this moving on its own. The keyboard tray could be a little bigger but it does allow enough room for a keyboard and mouse together. It also has a convenient hole in the top for cable management which is important for a desk that is moving up and down. By far the best thing about this though was that there was zero assembly required. It ships as a fully assembled unit. I received this product in exchange for an unbiased review. (5 stars) Sit, Stand, Zero install. I have used this sit-stand desk for many weeks and have not had any problems with it. The sit-stand desk came in a very large and heavy box. The delivery driver had a hard time bringing it to my front door. The box could have easily fit an unassembled coffee table or chair in it. There was nothing to assemble, just open up the box and put it on the desk. The sit-stand desk moves very easily with two hands both up and down. It has a lot of weight to it so it doesn't come off the desk when you lift it all the way up. You can position the height of the desk at any interval and releasing the handle locks it into position. Whatever height I set the lift to, I can lean my body weight on it and it will not budge. The rubber feet keep it from moving around the top of the desk while I lean on it. There is a grommet on the top to pass cables through but there is no cable management so everything just dangles from the bottom of the desk instead of over the back. (The only difference between the ARMSTSL and ARMSTSLG, is that the "G" must be for the grommet.) The sit-stand desk comes with a torque wrench to adjust the pressure needed to move it up and down. I found that I did not need to adjust the tension after I put my monitor, wireless keyboard and mouse on it. Without any weight on the sit-stand desk I had to lean on it a bit while holding the handle to move it down (no issues once things were on it). The keyboard tray can be adjusted about 1.5" outward, which was helpful as the top of the keyboard is not visible when the tray is back all the way. My only complaint with the sit-stand desk is the keyboard tray could be more adjustable. You can only have it in two positions (in or out) by moving 12 screws. And why does it have 12 screws when only 2 or 4 could have been used as it sits on a ledge? This sit-stand desk left is awesome, well built and very solid. It could have a more flexible keyboard tray, but this doesn't matter because it is so well built. I received this product in exchange for an unbiased review. This sit and stand desk comes out of the box ready to use. It only has one lever that allows a smooth up and down motion. It makes it easy to adjust to the perfect height. I really like the idea of this product. Take your existing desk and add this to the top and voila instant sit stand......well as long as your desktop is large enough and no obstructions around. My particular use for this was not too successful on the first desk i tried this on. It was not a fault of the product but the desk had a curved top so it was not 100% sitting on the desk. Not such a great idea so i tried my other desk an it worked perfectly. 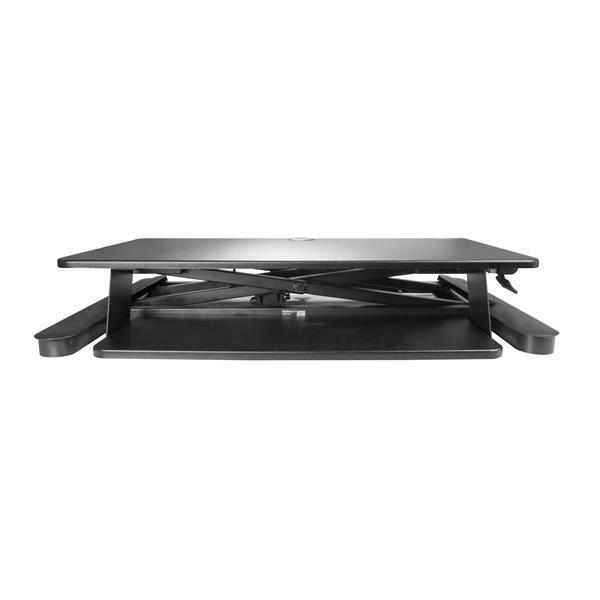 The unit requires no assembly and the unit has enough weight that it is not moving easily on the desktop surface. The unit allow for fairly easy movement to raise and lower and I had no issues getting this to a proper height for myself. The unit feels solid in construction and I do not see any real flaws with it. Overall i would say this is a nice unit. I would recommend this if you have a desk that you can just set this on and go. Overall a very good product and with a single monitor it works without issue. I received this product in exchange for an unbiased review.